Just a few short weeks remain until Baltimore Comic-Con 2017 and the most renowned publisher in comics today is gearing up to bring their A-game to Maryland’s biggest celebration of comics and pop culture! From Friday, September 22nd through Sunday, September 24th, Valiant Entertainment will be charging headfirst into Baltimore Comic-Con 2017 with a plethora of convention-only exclusives, signings, panels, programming, and other can’t-miss surprises you’re going to want to see for yourself! All weekend long, stop by the Baltimore Convention Center at Booth #2008 to discover why Valiant is the most celebrated publisher in the comic book industry with a complete selection of critically acclaimed Valiant trade paperbacks and deluxe hardcovers, including X-O MANOWAR, BLOODSHOT REBORN, NINJAK, HARBINGER, FAITH, and many more! 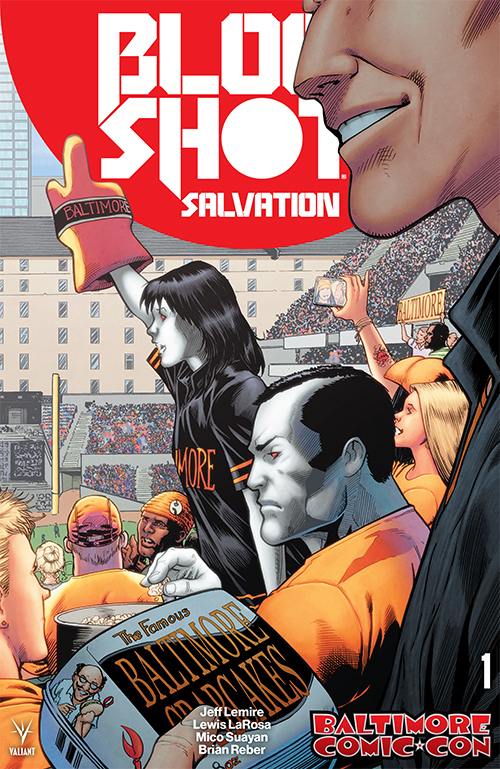 Also, be sure not to miss the BLOODSHOT SALVATION #1 Baltimore Comic-Con Exclusive Variant, featuring the amazing work of legendary artist Barry Kitson (Amazing Spider-Man)! Witness a devastating new beginning for best-selling writer Jeff Lemire‘s superhero saga here as he follows the Eisner and Harvey-nominated success of BLOODSHOT REBORN with a staggering ongoing series, featuring art by Lewis LaRosa (BLOODSHOT REBORN) and Mico Suayan (BLOODSHOT REBORN). Then: Join artist Barry Kitson for signings throughout the weekend, alongside other greats including including Joe Eisma (FAITH), Matt Kindt (X-O MANOWAR) and Rafer Roberts (HARBINGER RENEGADE)! Plus: Find out what awaits the Valiant Universe in the coming months with exclusive panels and presentations throughout Baltimore Comic-Con 2017! First, join us on Friday, September 22nd at 2:00 pm ET for the Valiant Spotlight: Matt Kindt panel presentation – featuring a wide-ranging conversation with one of the most lauded creative minds in comics today! From his creator-owned series – like Mind Mgmt, Dept. H, Grass Kings, Ether, and dozens more – to his work at the forefront of the Valiant comics line – including X-O MANOWAR, DIVINITY, NINJAK, and the upcoming HARBINGER WARS 2 – join the New York Times best-selling and Eisner Award-nominated writer and artist for a wide-ranging discussion of his work, present and future. The excitement continues on Saturday, September 23rd at 1:30 pm ET with the Valiant Presents ICONS: X-O Manowar, Bloodshot, Faith, and Beyond panel presentation! With record-setting series like X-O Manowar, Faith, and Secret Weapons, Valiant is gearing up for its biggest year yet! Now, find out what’s coming next for Valiant’s next blockbuster series like BLOODSHOT SALVATION, ETERNITY, NINJA-K, and QUANTUM AND WOODY! with an all-star cast of guests, including writers Matt Kindt (X-O MANOWAR, ETERNITY) and Rafer Roberts (HARBINGER RENEGADE)! Valiant’s next major leap forward starts here with exclusive announcements and artwork, first at Baltimore Comic-Con 2017! Finally: New to the Valiant Universe? Look no further than the Valiant 101: Jump On Board Here! panel presentation on Sunday, September 24th at 1:30 pm ET – a concise and fun-filled introduction to the origins and adventures of Valiant’s greatest and most iconic heroes, from BLOODSHOT and DIVINITY to FAITH and HARBINGER to NINJAK and X-O MANOWAR! From Buzzfeed and Entertainment Weekly to The Guardian and dozens more, Valiant has been hailed as the premier superhero publisher in comics today… Now, look no further than this panel of Valiant all-stars to find out where to start!